Feel the cool air coming out of our summer earth tube. After keeping comfortable with relatively little effort and cost all winter, we were a bit nervous about how comfortable our sustainable Haven™ home would be when temps heat up during the summer time, without mechanical air-conditioning and no tree cover for shade. Our plan has been to use our homemade earth tube system to cool the Haven™ down in the summer months. Our Plan B was a swamp cooler. Although swamp coolers work rather well in our dry desert climate, we wanted to avoid the added mechanical element if at all possible to support our green building goals. 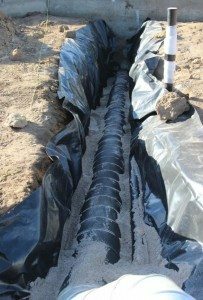 During construction, while excavating for the foundation, we installed some earth tubes that go about 6 ft deep in the ground and then daylight up a short way from the home. One earth tube will daylight in an attached greenhouse (part of our long range plan) for use during winter. Air coming into the Haven™ will be close to the same temperature year round because at 6 ft. under, the ground temps stay a constant ~54 degrees. Although the Haven™ was extremely comfortable last winter, the winter earth tube will reduce the already small amount of pellets we used in our pellet stove. If we do have occasion to use the furnace, pre-tempered air will take a lot less energy to heat than air that comes in at below freezing temps. The summer earth tube comes up in an old three sided hay shed where the shade provides slightly lower temps than in the direct sun. With temps in the 90’s this week, we felt immediate relief as soon as the system was connected. How our earth tube works is simple. We have a solar powered attic fan in the ceiling of our bedroom. 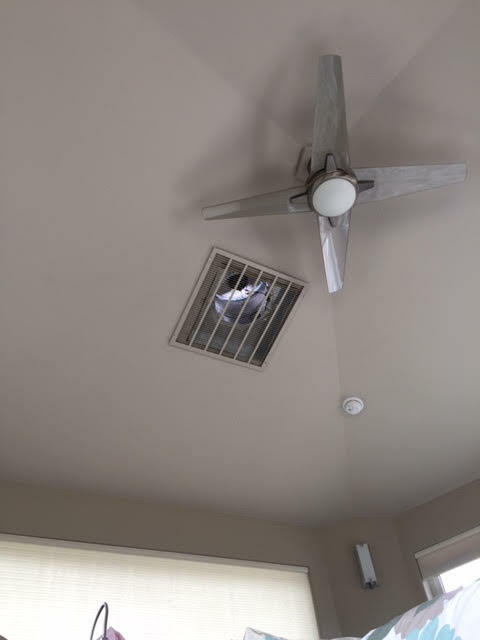 Exhaust fan in the upstairs ceiling. When the sun shines on the fan’s solar panel, the blades start moving. Because warm air rises to the top and the geodesic dome type shape of the Haven helps that air to easily find its way to the highest part of our home, the fan exhausts that warmest air to the outside. As long as there is nowhere else for the air to escape, the pressure differential that is created by sucking out the warm air, pulls the cool air in through the vent (with filter) that is on the outside end of the earth tube. The cooler incoming air finds its way through duct work that is under our insulated slab and exits into the Haven through the floor registers. If we want to augment the natural functioning of the system, we can turn on the house fan that is part of the furnace system and speed up the process a bit, allowing for a larger volume of air to flow through the home. Cooling our Haven with earth tubes is a simple and cost effective way to get more with less.